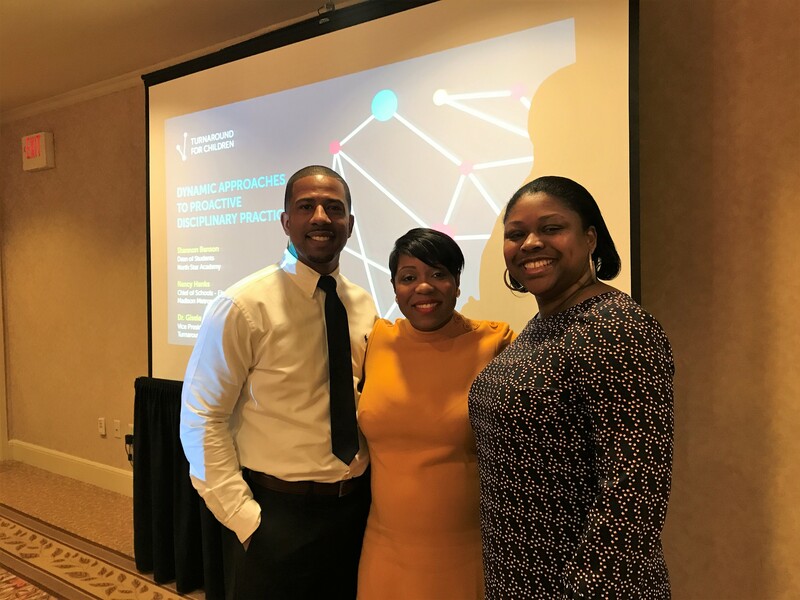 Pictured left to right: Shannon Benson, Dean of Students, North Star Academy; Nancy Hanks, Chief of Schools – Elementary, Madison Metropolitan School District; and Gisele C. Shorter, Vice President, Policy and Partnership Engagement, Turnaround for Children. Gisele C. Shorter, Vice President, Policy and Partnership Engagement moderated a panel, Dynamic Approaches to Proactive Disciplinary Practices, at the 2018 Yale School of Management (SOM) Education Leadership Conference. The panel featured Shannon Benson, Dean of Students, North Star Academy and Nancy Hanks, Chief of Schools – Elementary, Madison Metropolitan School District. Each year, the Yale SOM Education Leadership Conference gathers over 750 education experts, practitioners and leaders to discuss innovations in K-12 education reform. The theme of this year’s conference, Fostering the Ecosystem for Change, asked participants to explore various approaches to promoting educational equity and creating lasting social change through education.